This chapter describes how to prepare your Freescale FRDM-K64F board and install the Oracle Java ME Embedded 8.1 software on it. Micro-USB power supply of 0.7 or greater amps, and 5 volts. Note that the power supply must have a micro-USB type B connector, not a regular USB or mini-USB connector. You must use only SD cards. Work with SDHC cards is not guaranteed. A terminal emulator program, such as PuTTY. Ensure that you have the latest firmware on your K64F board. Connect the K64F board to your host computer with a micro-USB cable using the slot marked USB as shown in Figure 1-1. The flashing status light indicates the board has power. In a few seconds your computer recognizes the mbed microcontroller and displays it as a standard USB drive. 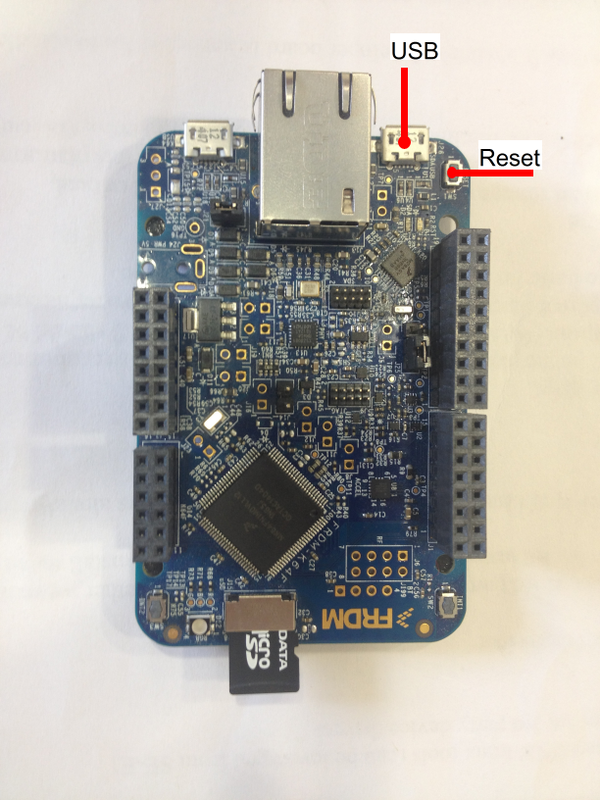 Description of "Figure 1-1 Freescale FRDM-K64F Board"
Open the mbed.htm file on your MBED device in a text editor to learn the firmware version. Open the mbed.htm file in a browser to log in at mbed.org. If you do not have an mbed user account, click Signup and create the account. Otherwise, login in with your username and password. Jumper J25 is responsible for the configuration of the Reset button. For a successful firmware update, it is important that jumper J25 connects SDA and SW1 pins. Turn over the board to ensure that the correct pins are connected. 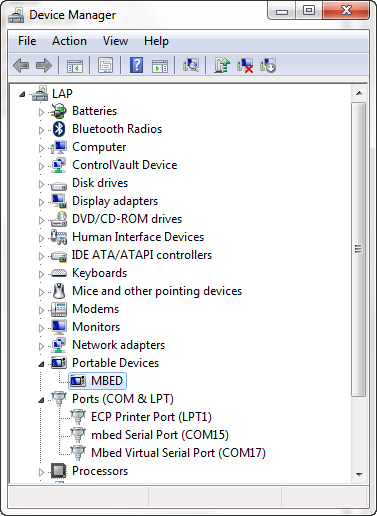 To learn the identity of the serial port, open the Windows Device Manager (by clicking Start then Device Manager) and expand the Ports (COM & LPT) line as shown in Figure 1-2. 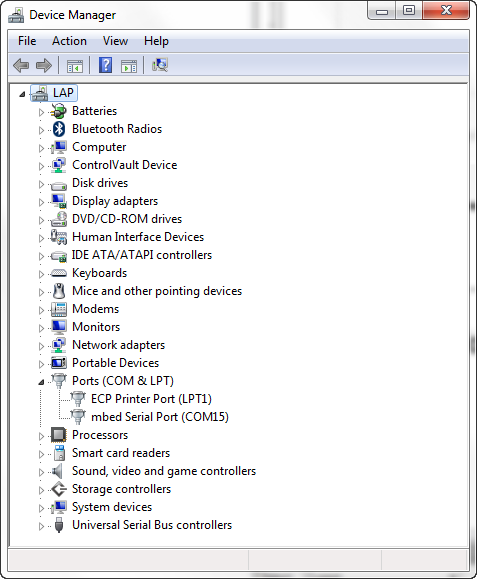 Description of "Figure 1-2 Windows Device Manager Displaying an mbed Serial Port"
The USBSerial interface is used to emulate a serial port over USB. If you want to communicate to your K64F board using this serial port or install the Java ME Embedded software on your board using a feature of the Oracle Java ME SDK called Device Installation Wizard, you need to configure the USBSerial interface. Connect the K64F board to your host computer with the second USB cable using the slot marked K64F USB. On Windows, perform the following steps. Download an archive from http://mbed.org/handbook/USBSerial and extract it on your host computer. Install the driver using the Windows Device Manager as described at http://mbed.org/handbook/USBSerial. After you successfully installed the driver, the Windows Device Manager displays the Mbed Virtual Serial Port (COM ID) as shown in Figure 1-3. Description of "Figure 1-3 Windows Device Manager Displaying an Mbed Virtual Serial Port"
To install Oracle Java ME SDK 8.1 platform, see Oracle Java ME SDK Developer's Guide for complete instructions. Download the binary zip file and install it manually. Use a feature of the Oracle Java ME SDK called Device Installation Wizard. This section describes using the Device Installation Wizard to install the Java ME Embedded software. Ensure that an SD card is inserted into the K64F board, the board is connected to your host computer with two USB cables, and also connected to a network socket with an Ethernet cable. To install Java ME Embedded software on your K64F board, perform the following steps. 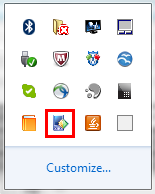 Right-click the Oracle Java ME SDK Device Manager icon on the notification area as shown in Figure 1-4 and choose Manage Device Connections. Description of "Figure 1-4 Oracle Java ME SDK Device Manager Icon"
Description of "Figure 1-5 Device Connections Manager"
Click Flash. The Flash Devices window opens up. Select an mbed device and click Flash. Wait while the Java ME Embedded runtime image is being installed or updated. The K64F board is now registered, has the Connected status and is ready for work. Extract the contents of the zip in a directory on your computer. Copy the flash\JavaVM.bin file from the extracted directory onto your MBED drive. Mount the SD card to your desktop computer and copy the sd_card\java\jwc_properties.ini file from the extracted directory to the java directory on the SD card. Eject or unmount the SD card from the desktop computer. After the green light on the board stops blinking, insert the SD card into the K64F board and press the Reset button. By default, the FRDM-K64F board contains the _main.ks file with a dummy certificate. To make SSL/HTTPS connections from the K64F board, import certificates using either of the following procedures. Create an empty /java/_main.ks file on the SD card and use the mekeytool.exe tool to import appropriate certificates into the K64F board. Create the _main.ks file by using the MEKeyTool.jar with -version option and copy it in the java directory on the SD card. For more information about using the mekeytool.exe tool, see Manage Certificates (mekeytool) in the Oracle Java ME SDK Developer's Guide.